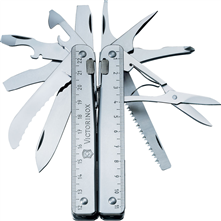 Visit Victorinox Swiss Army's SwissTool page. 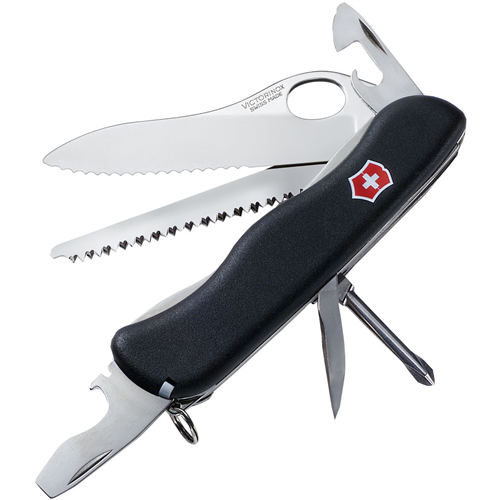 "Victorinox Camp & Hike Swisstool Swiss Army Multitool Stainless Steel 53905. The lock release offers piece of mind when your mind while you work. Includes nylon belt pouch." 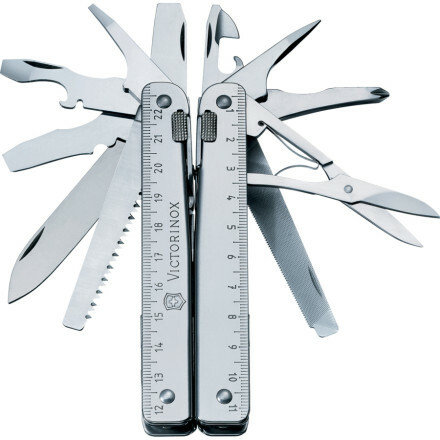 Victorinox designed the SwissTool Spirit Multi-Tool so you can access all the locking tools with the needle-nose pliers in the closed position. This means the handles stay together for a compact, useful grip when you're using the three screwdrivers, scissors, metal saw, or wood saw. The wire cutter handles up to 40hrc wire, a crate opener makes fast work of wooden boxes labeled "fragieleay" (must be Italian), and the needle-nose pliers come in handy for anything from fixing eyeglasses to loosening knots. Store the 5. 75-ounce Victorinox Swiss Tool Spirit in the included leather pouch. 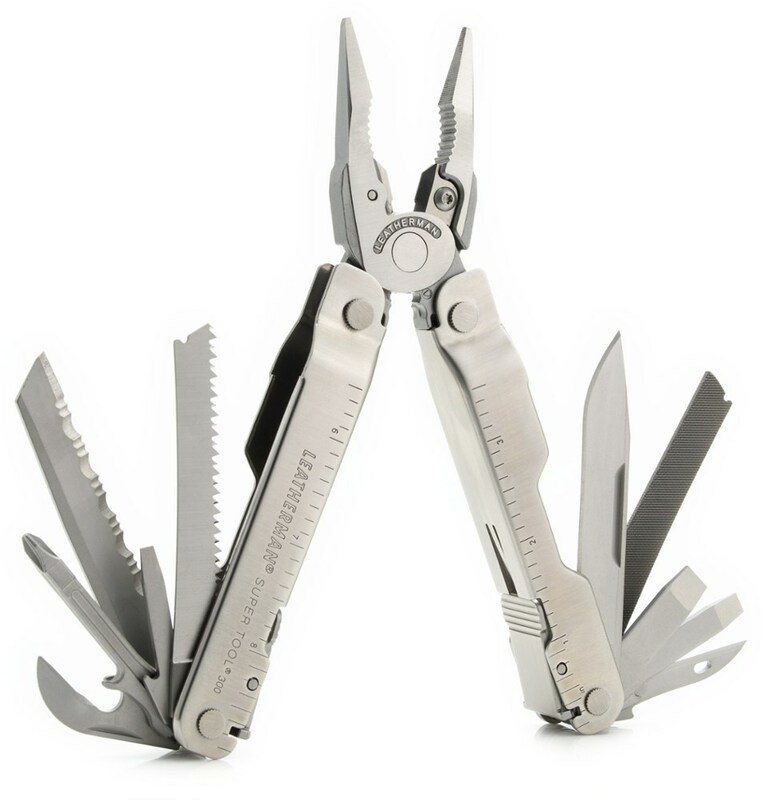 High-grade stainless steel tool, ruggedly constructed to withstand use under the most rigorous conditions. 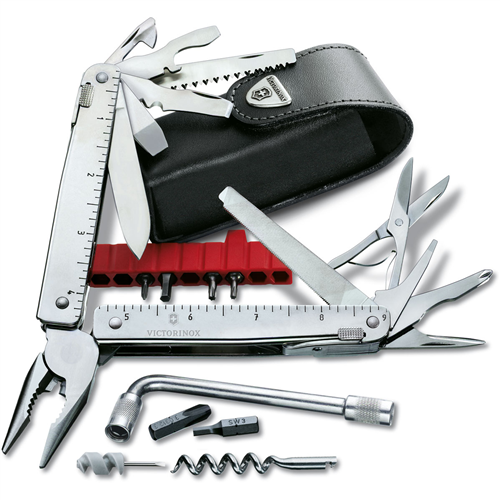 Easy Access - Tools can be opened directly, without first having to open the pliers. Locking Device - A special slide mechanism locks tools in place when opened (180?). 23 features including pliers, screwdrivers (2 mm, 3 mm, 5 mm, and 7.5 mm), wire cutter, cap lifter, large blade, serrated blade, metal file, metal saw, wood saw, reamer/punch, Phillips screwdriver for small and big screw, chisel/scraper, strong crate opener, wire bender, wire stripper, wire scraper, can opener, 9 in. rulter, 230 mm ruler, electrical crimper. Wt. 10z. CLOSEOUTS . 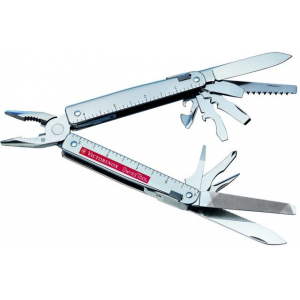 The ideal tool for the jobsite, trail or home repair project, the Victorinox Swiss Army Swisstool features a huge array of essential tools from scissors to screwdrivers to pliers. Plus, this combo kit comes with a premium, aluminum LED flashlight. Includes: Pliers Screwdriver (2mm) Screwdriver (3mm) Wire cutter (for wire up to a hardness of 40 hrc) Screwdriver (5mm) Bottle opener Screwdriver (7.5 mm) Large blade Scissors Metal file Metal saw Wood saw Reamer/punch Phillips screwdriver Chisel/scraper Strong crate opener Wire bender Wire stripper Wire scraper Wire crimper Can opener Ruler (9 inches) Ruler (230mm) Hard wire cutter Lanyard hole Multi tool (open): 6-3_4x2-1_4x1_2 Multi tool (closed): 4-1_2x1-1_4x1_2 Flashlight length: 4-3_4 Weight: 10 oz. 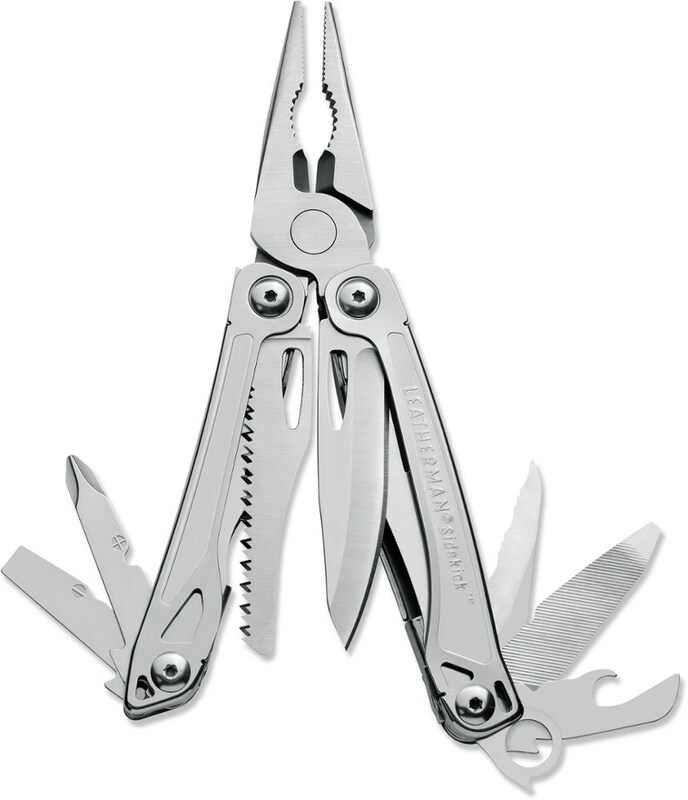 multi tool, 1.2 oz. flashlight Material: Stainless steel, aluminum and leather Made in Switzerland Please read our policy on ordering knives. Export restriction: cannot ship internationally.